Holidays are a time when family traditions are in full swing. However, including a loved one with dementia can mean that some changes might be in order. 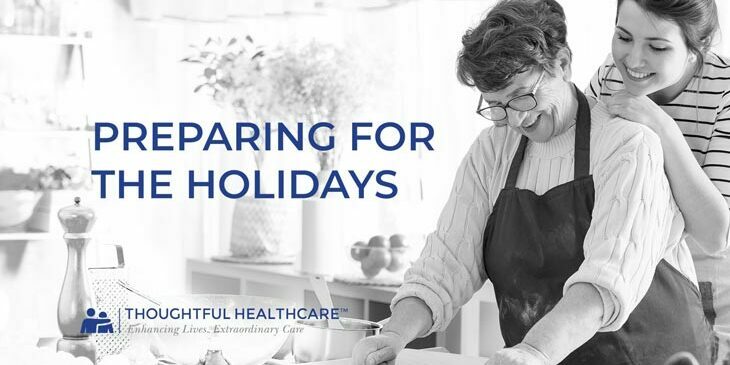 Because dementia can be unpredictable, being more flexible with holiday traditions might make everyone a little happier, says Tim Tholen, CEO and Founder of Thoughtful Health Care and its affiliates in Kansas City. The “Preparing for the Holidays” video will help plan for holidays with a loved one who has dementia. You can still enjoy a fantastic holiday season, even if it looks a little different. Start by making flexible plans. If your family wants to stick to specific holiday plans, factor in some alternatives for the loved one with dementia. Allow for some leeway in traditions. Someone with dementia might not be able to be able to sit through long events or services. Watching for signs of overwhelm can help prevent behaviors. Try to take the regular schedule into consideration and keep things familiar. Do yourself a favor and ask for help if you need it. Take the time to make a few phone calls to help “level set” expectations. This can do a lot to help prepare guests. Let people know that dementia is a disease that can cause certain behaviors, and these behaviors are not supposed to be taken personally. Our professional caregivers at Kansas City Home Care are here to support you, and can help with holiday events and outings with your loved one as part of a routine. Please feel free to contact us for more information. Click here for more Alzheimer and dementia care videos. For more information about Kansas City Home Care visit the Kansas City Home Care website.